Walking on a glass walkway suspended 1,000 meters up a mountain is supposed to be terrifying — but not this terrifying. Just two weeks after it opened to a nervous public, a walkway in China’s central Henan province was evacuated after cracks appeared. Reports describe visitors running and screaming in panic as they saw the damage on the U-shaped path at Yuntaishan (Yuntai Mountain) Scenic Park. “As I was approaching the end of the passage, I heard a sudden loud ‘bang.’ My legs were shaken. I looked down and saw the pane underneath me had shattered. 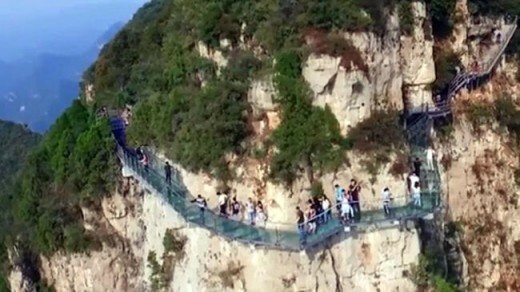 Opened on September 20, the cliffside path spans 260 meters (853 feet), with a 68-meter glass-bottom (223-foot) section. It hangs 1,080 meters above sea level. Image: One of the cracked walkways that alarmed tourists. The park issued a statement next day, admitting discovery of “a small amount of cracks” during a regular inspection. It said the damage was caused by “external force” from a sharp object. There was no danger, it added. This level of damage was disputed by the Weibo user who claimed to have seen it. The park said the path will be shut temporarily until the broken pane is replaced. 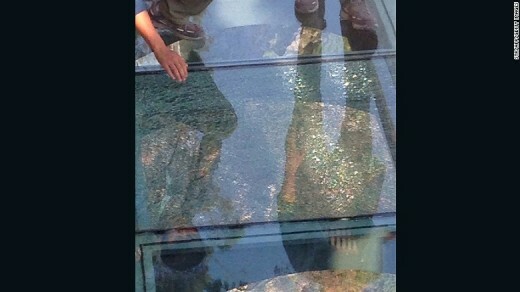 Yuntaishan’s management emphasized that such damage isn’t unheard of among glass-floored attractions around the world, pointing to an incident in 2014 involving London’s Tower Bridge. Yuntaishan’s passage is one of a recent series of glass-bottomed walkways to open in China. Shiniuzhai park in Hunan province was opened last month, just in time for China’s October 1 national holiday. Zhangjiajie Grand Canyon bridge is due to open in Hunan province later this year, about 300 kilometers (186 miles) northwest of Shiniuzhai. When completed, the Zhangjiajie structure will be the world’s highest and longest glass bridge — 430 meters long and 300 meters high.